Eileen and I have just returned from a family visit to the U.K and had some very nice weather for a change. Although we enjoyed some good family time together, we still appreciate the wonderful area of Spain that we are so fortunate to live in. I expect that quite a few of you watched the Royal Wedding. I have to say that I am a great admirer of both William and Harry as they have brought a new dimension to the Royal Family. I wish Harry and Meghan all the very best of their new life together. There are still tickets available for the Quiz night on the 20th June. The proceeds from which are going to the “ Make a Smile Charity”. Please support this event as it is for a very worthwhile charity. This is our appointed charity for the year and at the committee meeting we decided to have a donation box for the above mentioned charity available at all the general meetings for the remainder of the year. Tickets for the Quiz night and the forthcoming event at Font Santa ( in September ) will be available at the June meeting. I hope to see quite a few of you at these future social events as they need your support. Can you and your members help me please? My partner and I have rented our house for July and August and had found alternative accommodation. However we have been contacted by the owners to say they have now sold their property and we can't go there. We have advertised, looked on-line and asked around without success. July is coming ever nearer and we are now panicking. We just need a small property nothing special. We have two very small well-behaved house trained dogs, Georgie is part shih tzu and Rufo part miniature schnauzer, they are adorable. We wondered if there was somebody within the membership who could do with some extra cash, we don't mind travelling a distance from Moraira. (We are U3A members). 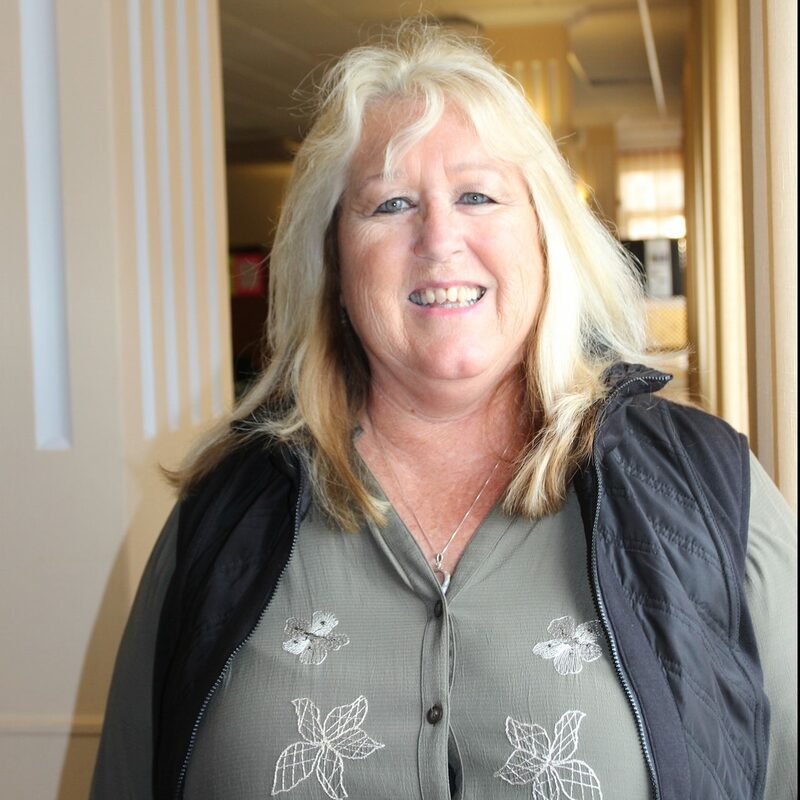 Thank you so much for your help and we look forward to hearing from you! Are there any other parents or grandparents who have children in the Moraira area during the period 29th July to 17th August that might like to meet sometime to let the children play together? We have a lively 8-year old boy, with bundles of energy. He loves swimming and anything sporty, as well as Lego and board games. His sister will be 5 in June, and she isn’t sporty, but loves pretend play, soft toys and tea sets. She also loves playing with her younger 3 year old cousin. My email is hilary_coombes@hotmail.com or telephone 966497333. Do get in touch if you think we might be able to help each other. I am a member of Moraira - Teulada U3A. We are really looking forward to the May Dinner & Dance. We do not have a car at the moment. We live on calle Mar del Labrador, Moraira, close to Monroe 's carvery. Is there anyone who lives near there who might like to share a taxi with us or who we could share petrol costs with? 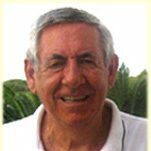 At the last U3A Committee meeting we discussed the 10 year Anniversary Celebrations and it was noted that the original group leaders had been thanked by John Hopwood when he was still President. 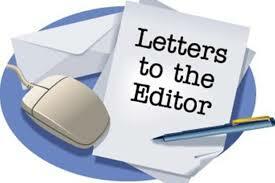 It was also discussed that we have not made official the adoption of a Charity for the year. It is clear that membership money can not and will not be used for any charity donations, however as an organisation we would look at fundraising events and collection boxes for the nominated Charity each year. 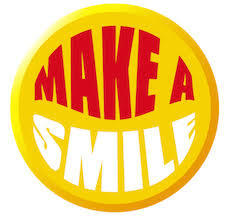 It was voted and agreed that "Make A Smile" would be the Charity of the year until our AGM next year. We are now ending our 10th year of ART/HISTORY talks. These were instigated by Brian Nicholls, who definitely deserves our thanks and praise. Brian is one of the original founders of our U3A. I am a much later addition and came on board when all was already organised and in place! Brian and I have now taken on some individual tasks so that basic ‘donkey work’ does not get duplicated between us. One of mine is the sending out of reminders prior to all talks to those that have asked to be put on our emailing list. In the past few months I have had to change the way that I have been sending these because GOOGLE blocked me from sending group emails. Their machinery must have seen me as one of those that was up to no good and possibly as a dangerous scammer! Piotr Azia, our webmaster, came to the rescue and with his help we are now sending reminders using something called MailChimp. All is good again BUT some of the addresses on the original list had got lost on the transfer. I would like to advise our members that if there is some mix-up that it is not of our doing and that any members that are not receiving news about the History and Art talks should write to Brian and/or me via our U3A’s website. I will then reinstate/add them on to the latest list on the said MailChimp. The talk will look at the history of this famous book and follow its impact on British literature and subsequently on film and television from printed page to silver screen. 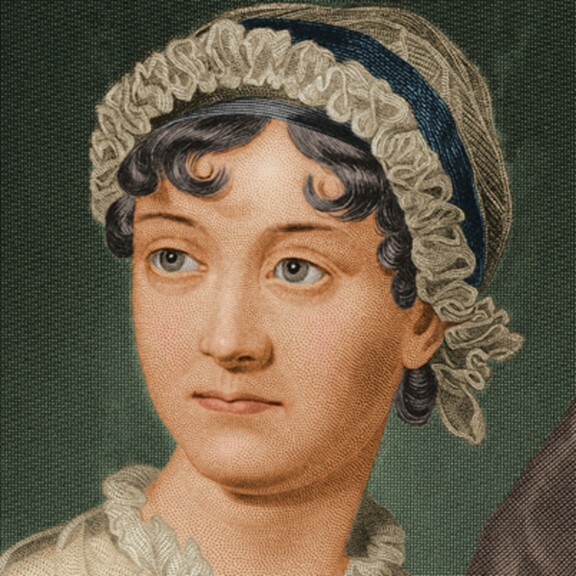 The talk will look at the story behind ‘Pride and Prejudice, how it was initially received and how the book has performed over the intervening two centuries. It has prompted innumerable prequels, sequels and other spin-offs. In particular it will look at the 1995 BBC adaptation, and the 2005 film version, and will visit some of the homes/landscapes used in those adaptations. There will be plenty of images of Colin Firth to satisfy the females in the audience - but my aim will be to show that Pride and Prejudice is rather more than simply "chick-lit". 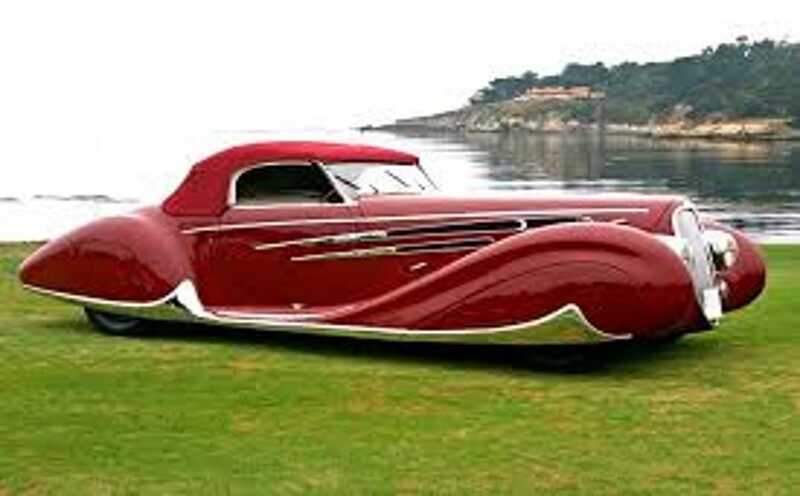 Subject:The History of the Automobile – or the car! It will be a light-hearted talk with many illustrations and is almost entirely non-technical and non-mechanical and is intended to be of as much interest to the ladies as to the gentlemen. The talk will commence with some information on La Marquise, which is the oldest car still in full running order today, followed by a quick resume of the various vehicles owned in the past by the speaker. Then, following a brief look at the first steam driven cars, it will cover progress from those vehicles which used the first gas powered engines, before petrol was discovered, followed by the introduction of the petrol engine. There will be many illustrations of Veteran through to Edwardian, Vintage, Classic and the latest available “Supercars”. We will finally have a look at various manufacturers' ideas of what sort of vehicle we - or our children - will be driving in the future. As part of our celebrations for our 10th anniversary year, your Social subcommittee is organising a fun packed afternoon for you at Font Santa on Tuesday, 18th September 2018. The event will start at 12:00 noon. To get you started, there will be a bottle of cava to share between two persons. 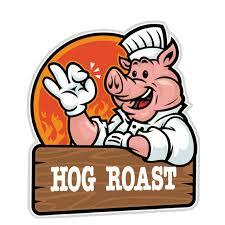 A hog roast will already be under way and will be served at 12:30, together with crackling, salad and condiments. Please feel free to bring your own nibbles, postres and other drinks. Musical entertainment will be provided by Take 2 and Moonshine until 4:00 p.m. Entrance and food will be by ticket only and all it will cost you is 12,50 euros per person. Tickets will be on sale, subject to availability, at the General Meetings on 4th June, 2nd July and 3rd September. The event is only open to members of U3A Moraira-Teulada, so please bring your membership cards when purchasing your tickets. As the food will be prepared on site, please do not bring your dogs. There will be plenty of tables and seats, but please bring your own with sun shades if you wish. Please remember to bring your tickets with you on the day. 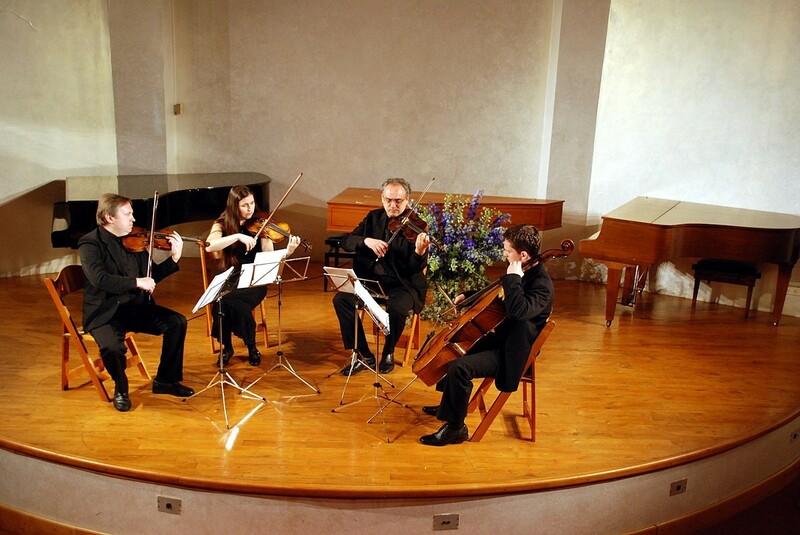 New Group - Classical Music String Instrument Group. Classical Music String Instrument Group. 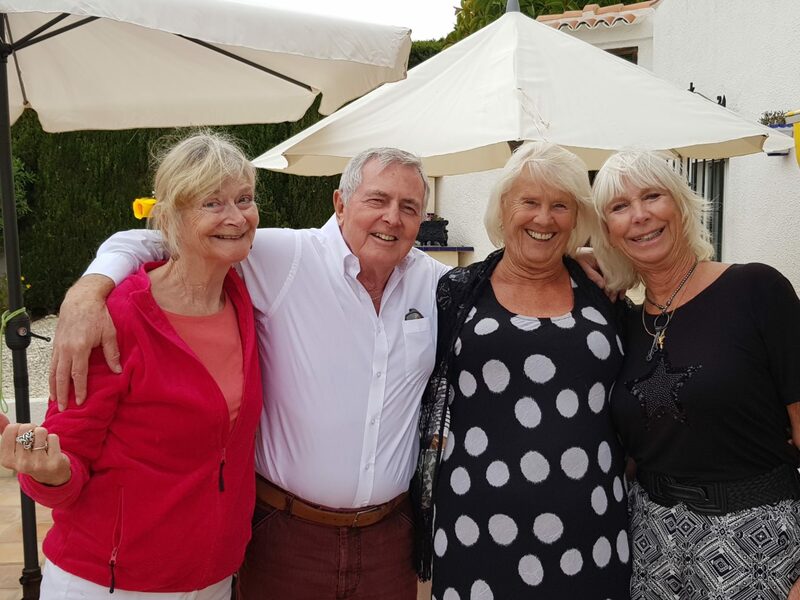 The U3A Spanish conversation group celebrated its ten year anniversary with a fiesta at the home of the group leader, Sheila Shipsides, and included all four founder members. The group first met in an upstairs room at Sol Park, and after moving around various venues over time is currently meeting at Relax Café. It is very friendly, fun, rather noisy, and welcomes anybody with a sufficient Spanish to hold a conversation and enjoy themselves. Contact group leader Sheila via the website or the monthly meeting for more details. 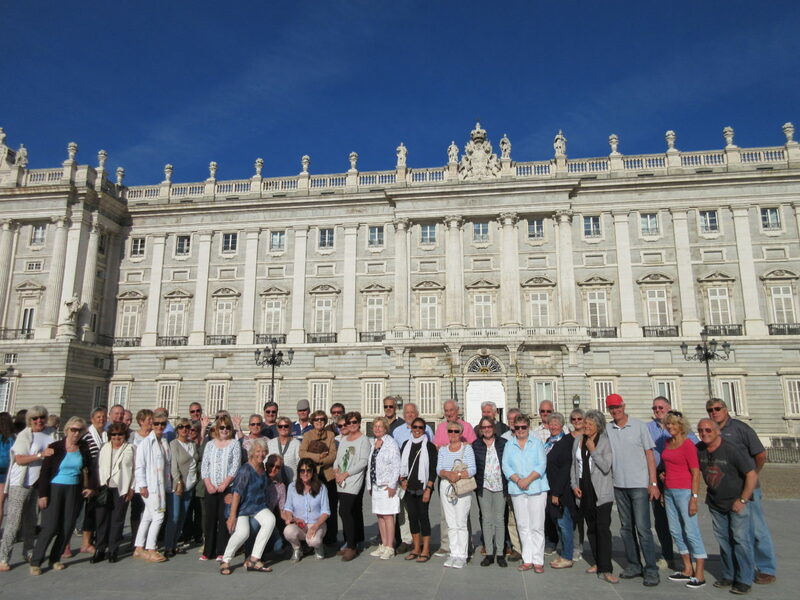 In April a Travel Group of 49 Moraira Teulada U3A members journeyed to Madrid for a 3 night visit. En route we stopped off for lunch at Aranjuez whose attractions include a royal palace commissioned by Phillip II and extensive gardens and parkland. There is a road train available which is useful in getting around the parks, stopping in a couple of places where there are options to visit a Royal Barge Museum, Royal Billiard Hall and Ballroom. There is also a tourist boat on the River Tagus which offers a different view of the parks. Arriving in Madrid in the late afternoon, we found our hotel very conveniently located for the very grand Plaza Major with its many restaurants and shops. The following morning, a coach tour of the city accompanied by a local guide was available which gave a flavour for the city and was very useful in informing people of what they might like to visit in detail. We got a very good appreciation of how green the city is, of the 3 distinct areas and of the many monuments, grand buildings and museums. The next day, there was an optional trip to San Lorenzo del Escorial, once again accompanied by our very knowledgeable, local guide. The Escorial is the burial palace of the Spanish Monarchs for the last 5 centuries and was also commissioned by Phillip II. This was followed by a visit to The Valley of the Fallen. This was commissioned by Franco supposedly to honour the dead of the Spanish Civil War, it consists of an underground church and tomb topped by a 500 foot stone cross but it is seen by some as very much a monument to Franco. On the return journey to Moraira, we stopped at Al Caza de la Juan visiting a bodega where after testing their wines we were treated to a delicious tapas lunch with the opportunity to buy some of their very good wines. The trip was full of interest with many options available and it is most important offer huge thanks to Carol, Lynn and Sue for their excellent organisation and also Norman who researched and supplied us with comprehensive hand outs as well as ensuring no one got left behind! 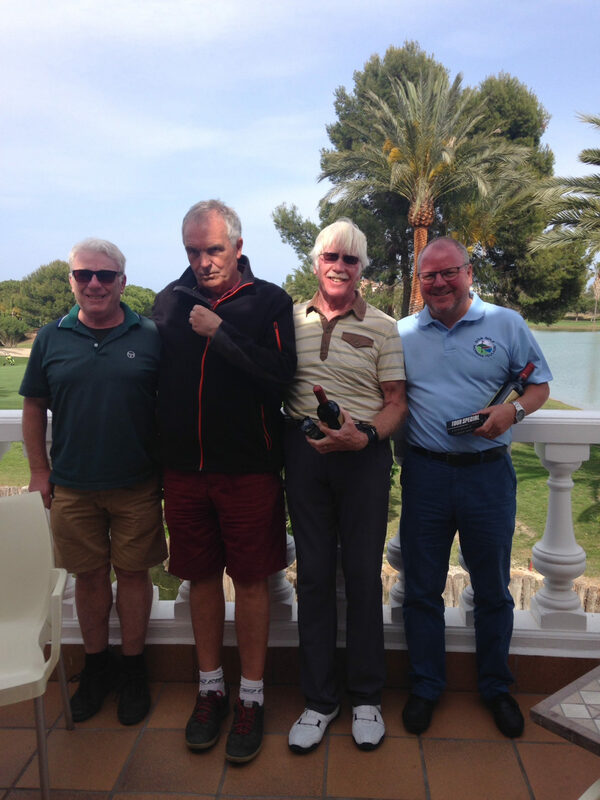 U3A Golf Moraira welcomed back a fun Texas Scramble at Oliva Nova on 26 April but it did have a touch of the X Files about it. The winning order turned out to be exactly the same as the order in which the teams teed off. We all expected Mulder and Scully to present the prizes but all we got was good old John Ross. Team 1 John Ross, Paul Westerman, Paul Sankey and Ian Munro took 1st prize with a nett score of 64.6. Team 2 Gordon Mitchell, David Noble, Stuart Boud and Harvey Bourne were in 2nd place with a score of 65.1 and Team 3 with Jerry Arnold, Robert Clark, Trevor Wilson and Roy Packard with a score of 66.5 came 3rd. Nearest the pins on Holes 3 and 16 went to Bina Tomes and Harvey Bourne. Harvey now has a store of wine bottles building up being looked after by Stuart Boud! The X Files theme didn’t just stop there when Trevor Wilson’s drive on the 11th disappeared up a palm tree not to drop down; never to be seen again. He also suffered when his driver was moving so fast on the 15th tee that it disappeared and totally missed the ball. His team members were moved to tears of laughter. Thanks to the admin team for the day of Stuart Boud, David Noble and John Ross for creating such a fun but weird day. Remember the truth is out there! Our next game is at Alicante on 8 May with only 2 places left and after that we are at Alenda on 25 May and that has only 8 places left. 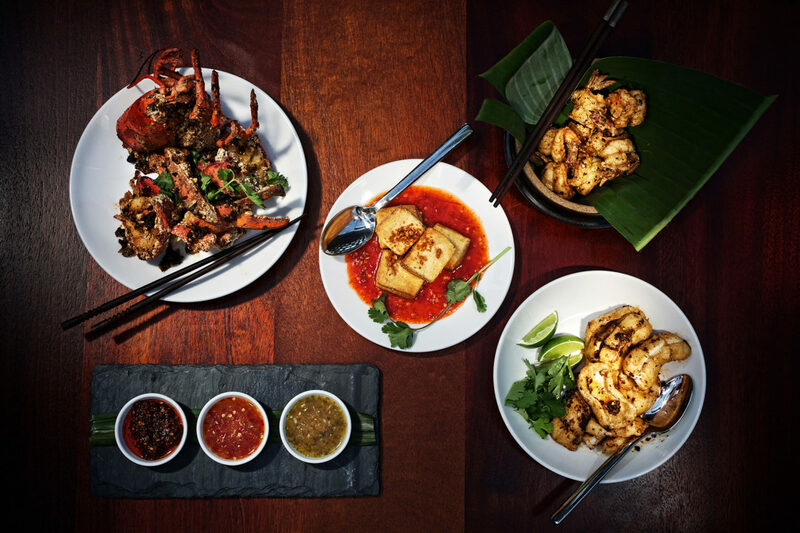 Book via the website as soon as possible to avoid disappointment. Regular readers and walkers will know that Leaders always check the walks before each Tuesday. Problems can be chains over parking areas, fallen trees after a storm, builders work, gates across tracks etc. These problems mean altering the walk or replacing it with another. Walkers are notified by email should this happen. This walk was the first to start at 9am but 23 walkers dragged themselves out of bed for what is a lovely walk. For once the leaders did not check this walk as they knew it well and were spending their time on forming a new walk elsewhere. There were a lot of felled branches over the paths but walkers coped with cheerfulness. Then leader Brian had to climb over a felled tree and another and another. Workers were making a wider firebreak! All turned round with comments like, ‘Who has the Kendal mint cake? Do we have a torch? Let’s go easy on the bottled water, it may have to last a long time!’ It was all good fun. Of course Leaders knew a way round the felled trees. It was a cool but sunny day and no one noticed the extra 300m detour. Leaders always emphasise the need for strong walking shoes and this was proved when one walker had a piece of wood penetrate the sole of her new walking shoes and come out the side. 24 walkers did the Thursday walk without incident. 36 & 22 walkers set off on this walk. It is along the side of the railway but of course there are no tracks at present. It then follows a sunken road which was bordered by masses of flowers of every colour. There are new vineyards on either side. A farmer was spraying, complete with mask and urged us to move quickly past. We then passed a small house where there were about 7 dogs all chained to trees. The noise was frightening. Further along were the kennels of hunting dogs. They were less boisterous. It was a lovely day and the temperature was just right for walking. 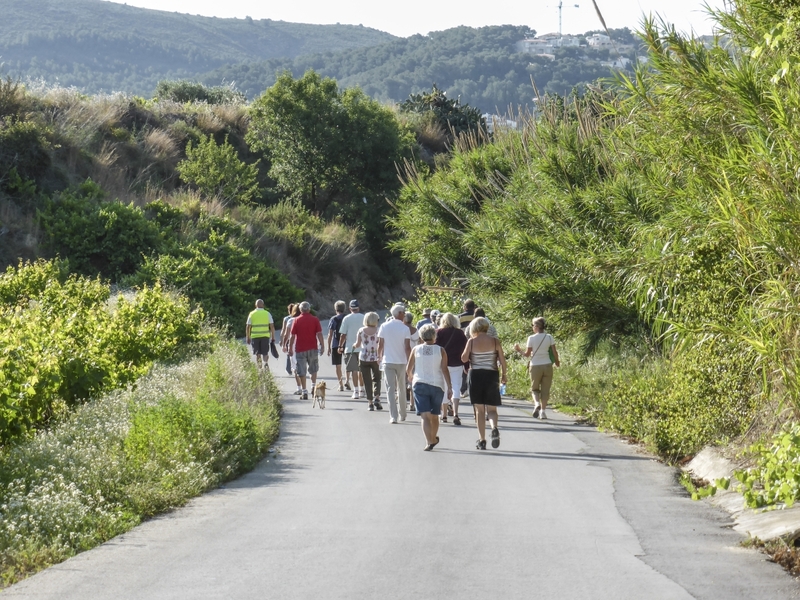 33 walkers arrived at the Industrial Estate Car Park in Teulada. The first part of the walk was along the edge of what is planned to be a larger industrial estate but we doubt it will be in our time! Then it became more interesting as we followed the path of the railway through fields of flowers. After crossing the track the route turned towards Font L’Horta where there is a field almost completely red with poppies. Leader Brian allowed walkers to stop and photograph them! The homeward walk was by the tree lined path back to the car park. This path was created by Teulada-Moraira Council and is lined with flowers. Despite the 9am start, the number of walkers has not diminished. 38 & 24 did this walk. Despite low cloud and the forecast of rain on Thursday 24 people arrived and survived the 5 spots of rain which fell during the walk! The sun was shining by the end of the walk. Part of the path had been ploughed up so leaders had tried to find an alternative track to avoid walking past the bins twice but there was no other way! However most walkers said they enjoyed the walk which passed stables with beautifully groomed grey horses, some splendid houses and some woodland tracks. The walk was in a figure of eight so passed one building twice where one walker was delighted to see yet another huge St Bernard only to have it pointed out that it was the same dog!! Everyone seems to enjoy the walks. Please note that the last walk of the season will be on 14th June 2018. The next season will begin mid September with some new walks added to the repertoire. 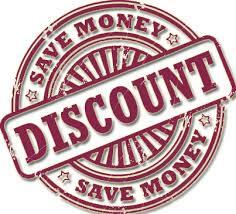 I have recently added some new businesses to your Discounts Page. Next time you are thinking about having some work done on the house, need someone to sort your pool, fancy a haircut or massage don't forget to check out the offers on the Discount page. It might only be 5 %, but the savings add up and could mean an extra glass of wine or two for you! Prolific, ripe and incredibly cheap at the moment, I bought 3 decent sized ones from Carrefour this week for just 2 euros! We all know to add to salads or make good ole Guacamole but what else can we do with these healthy fruit? 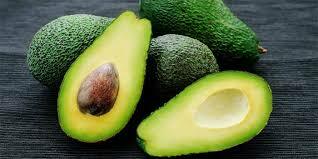 Packed with vitamins, minerals and fibre they contain the healthy cholesterol that helps reduce the bad type. Also a great substitute for diary in recipes. I sweet potato (about 200g), peeled and chopped into small chunks. Place the sweet potato in a heatproof bowl, cover with cling film and microwave on High for 8 mins, or until really soft. Leave to cool completely. Chop 1/4 of the sweet potato into even smaller pieces and set aside. Place the sweet potato, avocado, ground almonds, polenta, honey, eggs, baking powder, milk and 1/4 tsp salt in the bowl of a food processor. Blend until completely smooth. Divide the mixture evenly into the muffin tin, then top with the reserved chopped sweet potato, feta, seeds and a dusting of paprika. Bake for 20 mins at 180C/ 160 fan/ gas mark 4, or until risen, browning on top and cooked through – check by inserting a skewer to the centre, it should come out dry. Cool in the tin for 5 mins, then transfer to a wire rack and cool completely. Store in a sealed container for up to 3 days. Cook the spaghetti in boiling salted water following pack instructions. Put the avocado in a food processor along with the oil, garlic, half the parsley, a good squeeze of lemon and a large pinch of salt & pepper. Toss the avocado sauce through the pasta with the salmon. Season with lots of black pepper and another squeeze of lemon, to taste. Chop the remaining parsley and stir through to serve. Avocado, Peanut butter & Chocolate pudding. 2 tbsp smooth peanut butter. Scoop the avocado flesh into a food processor. Add the chopped banana, prunes, almond or coconut milk, peanut butter and cocoa powder. Blend until smooth, adding a little more milk if the blade gets stuck. Scrape down the sides once or twice and blend again. Divide the mixture between 4 small glasses. Mix the coconut yogurt with the honey and top each pudding with a generous dollop. Finely grate a little dark chocolate over the top and chill for at least 1 hr. The title of the talk is 'It's about time' . It will examine how the passage of time has been measured over the centuries - sundials, water clocks, pendulum clocks and atomic clocks, how its precise measurement was important to navigation, the requirement and problems associated with synchronising time across countries and now across the world, how Einstein's theories show how clocks are affected by gravity and relative speed and how this has to be taken into account for GPS to work. Finally, it discusses how we now know when time began - at the origin of our universe some 13.8 billion years ago. 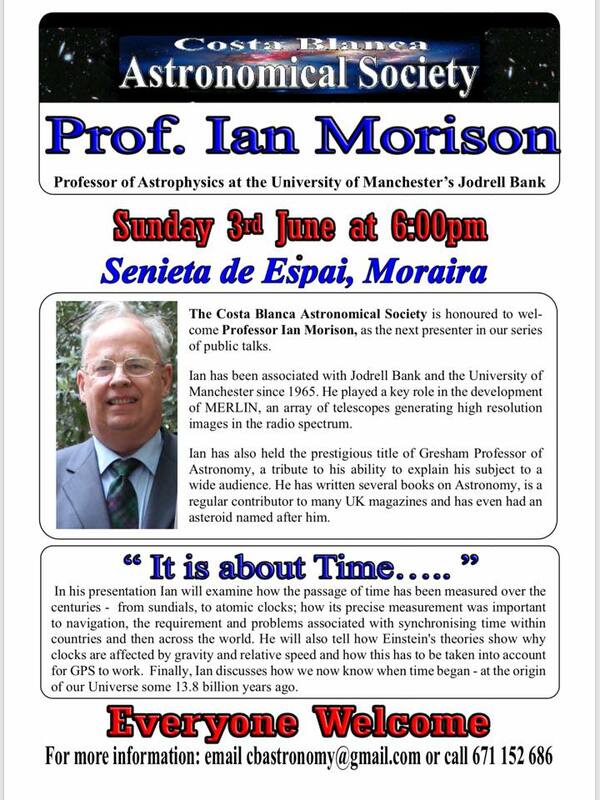 Ian is a professor at Manchester University and has held the Gresham chair in Astronomy for 4 years. He was very involved in the Merlin radio astronomy project. He has written several books about astronomy as well as his most recent on Astrophotography. He is a regular contributor to Astronomy magazine and the BBCs ' Sky at night' program. The talk is open to everyone who is interested. 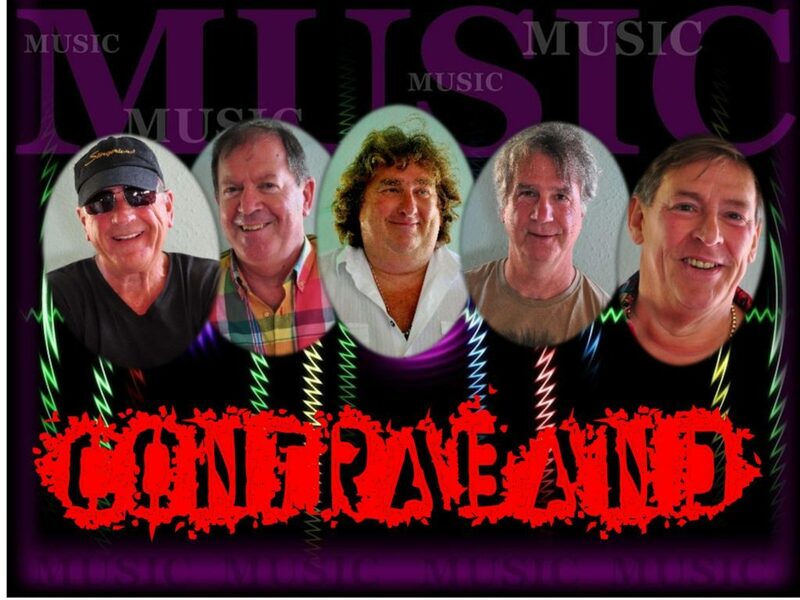 CONTRABAND will be back at SAXO, Moraira on Thursday 7th June, to provide another great evening of entertainment from 18.00 till 20.00, and will also be opening the Lions Summer Concerts season on Moraira seafront, next to the Castle, on Sunday 24th June from 20.00 till 22.00. 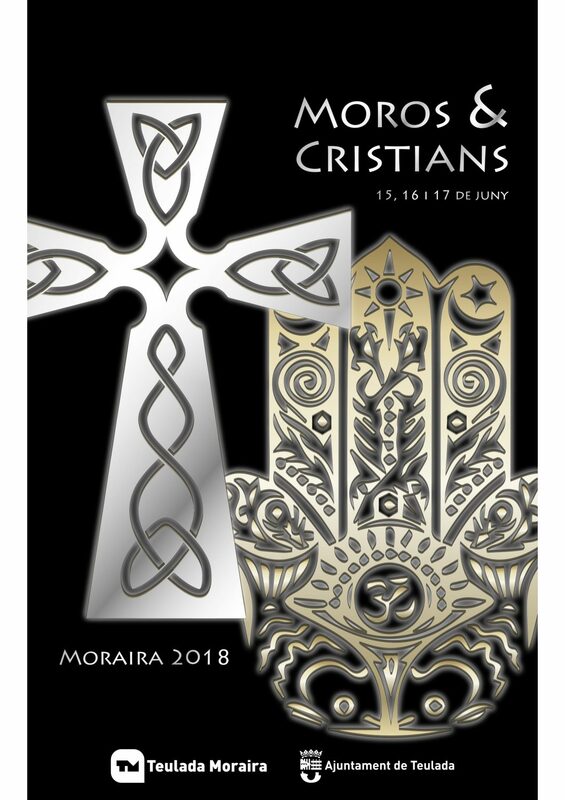 The Moors and Christians will be marching through the streets of Moraira from the 8th to the 17th June 2018. The packed programme includes not only the traditional parades, battles and the firing of the blunderbuss guns, but also a grand international music festival and several concerts. 23:00 The spectacular arrival of the Moors on the beach at Playa L'Ampolla and the commencement of the battle to conquer the Castle. 20:00 Battle on the beach and the conquering of the castle by the Christians. 20.00 Spectacular Parade of the Christians and then the Moors, followed by a grand firework display. Featuring Xanda Laguna are the Costa Blanca’s finest Soul, Funk, Disco Band. Awesome energy, amazing performance, great Party Band. 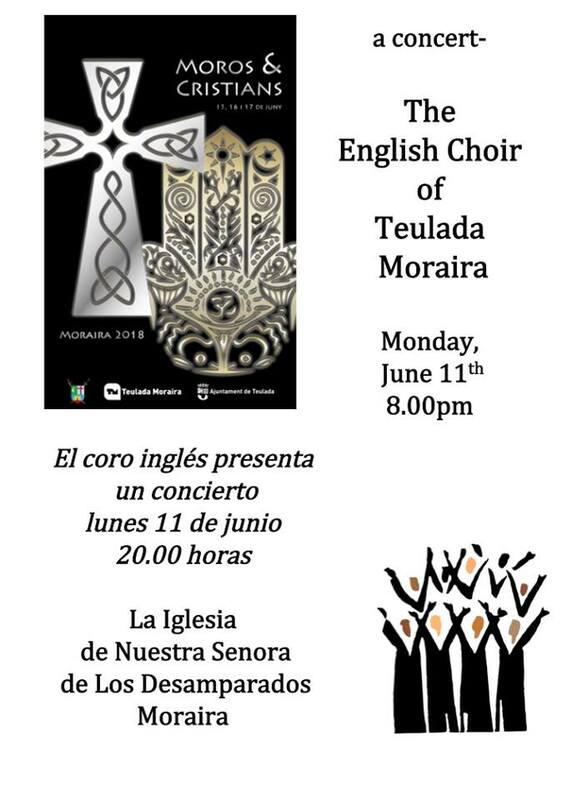 Following our much acclaimed Legends in Music Concerts this month, we shall be performing in Moraira Church on Monday 11th June at 8pm to delight our audience with another programme of music from a variety of memorable artists. 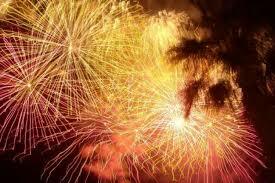 Moraira will be honouring Sant Joan, also known as San Juan, with a bonfire on the beach. The Noche Mágica as it is known, will take place on Saturday 23rd June 2018 on Playa de L'Ampolla. The evening will start at 20:00 with music and the hoguera will be set alight at midnight. To coincide with the summer solstice, and the eve of the feast of Saint John the Baptist, celebrations are held on the beach in Moraira & in the Town Hall Square in Teulada. Festivities include children's entertainment, preparation of the bonfire, dinner on the l'Ampolla beach, lighting of the bonfire, the traditional leaping over the embers and dancing to live music. On this same magical night folklore dictates that it is the most propitious time to cleanse the body and spirit by bathing in the sea at midnight, and to reveal the zealously guarded secrets of traditional remedies. 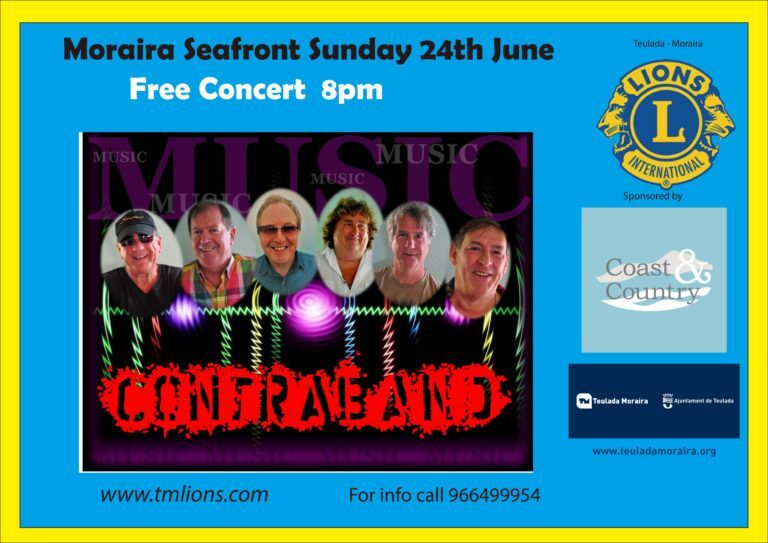 The TM Lions once again kick off a series of fabulous free concerts on the seafront in Moraira on the 24th June, starting with those veteran rockers “Contraband” (formerly U3A), with their mix of classic rock and pop songs from an era that we all fondly remember. Ah, nostalgia isn’t what it used to be! This will be a free concert, but donations are gratefully accepted. 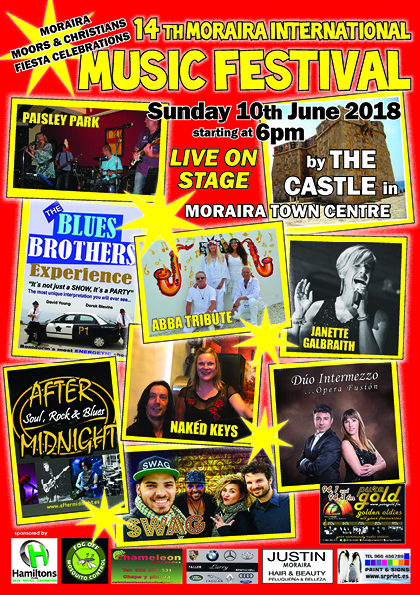 We have a great line up for the summer including Contraband, Bella Luna, Swag and, of course, Carolina Serrato with her Lady Gaga Experience show. Do come along and join in the fun. The concerts start at 8:00 pm and there will be a bar run by the local Moors and Christians committee. If anyone would like to help the Lions with fund raising at our concerts (putting chairs out/bucket rattling etc.) they will be most welcome and much appreciated.